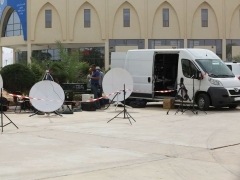 Sahara Media provides SNG uplink and live positions in Nouakchott, Rabat and Dakar. Sahara Media provides SNG and live stand-up facilities in Nouakchott, Dakar and Rabat. Nouakchott, Mauritania, January 2017: The Mauritanian broadcast services company, Sahara Media Agency, is offering live broadcast production and transmission facilities not only in its home base of Nouakchott but also in neighbouring Senegal and Morocco. Newly re-promoting its services on TVZ, Sahara Media says it can provide clients with SNG uplink, live stand-ups and video editing facilities in all three countries. Sahara Media Group was established in 1997 and is involved in several media ventures in Mauritania including TV broadcasting, radio and newspapers. For more details about its facilities, please click here.